I am a teacher. I love the time when the proverbial light goes on in a student’s mind and a theory or concept or method or technique suddenly makes sense. I witness the moment that a few sparks of knowledge kindle a fire of learning. I am a storyteller. Like many teachers, I enjoy stories that illustrate, illuminate, reveal, and surprise. They build bridges between what is and what could be. They make the impossible possible, the unimaginable imaginable. I am an instructional designer. I have practiced the science and art of instructional design for more than 30 years, and I sometimes refer to the design process I developed as a matter of wearing “three hats”—designer, teacher, and student. Wearing these three hats keeps me grounded (and keeps me honest), because I am not designing for monolithic stereotypes (learners, students, or teachers) but for real, live, fallible, brilliant, unpredictable human beings. I am intimately involved in my teaching, in my storytelling, and in my designs. For instructional design precisely, I cannot help but wear the three hats. In fact, I am concerned that not wearing one of those hats would remove me too far from the people who, ultimately, are potentially affected in so many different ways by my designs. I think a lot about teaching, telling stories, and designing instruction. Lately, though, I have been thinking more about how to present and explain, in a different way, something that is very close to my instructional designer heart—the process of writing learning objectives (a subject about which I have written a couple of times in this blog). More precisely, I have been searching for a way to both present and explain the connections that tie together the process of using two tools that I introduce to my beginning graduate students in their instructional design principles course. The first one is a seminal tool that nearly all instructional designers learn to use, Bloom’s Taxonomy of Learning Domains in the form of the “revised taxonomy” (Anderson et al., 2001). The second one, “a critical tool in the development of effective instruction,” is Robert Mager’s approach (1997) to writing learning objectives where he speaks about developing learning objectives that contain performance, conditions, and criteria. Mager said that learning objectives are “…useful in pointing to the content and procedures that will allow instruction to be relevant and successful. They are useful in helping to manage the instructional process itself and to point to the means for assessing instructional success. Objectives in the hands of the students prevent the students from having to guess at how they might best organize their time and effort” (1997, p. 43). Mager’s model is not typically represented by an image, but I created a worksheet that uses a simple three-column table to illustrate how to employ the three components (conditions, performance, and criteria) of the typical Mager-style learning objective. While these graphical/textual approaches appear to work for students, I wondered if perhaps there was another way to represent the information, and I began to think of alternatives. Following is my attempt to take an entirely different approach, with a major caveat: I am definitely not a “math person,” but I challenged myself to try to think in “mathematical” terms. Here’s what I came up with. A learning need is LN (derived from an analysis). 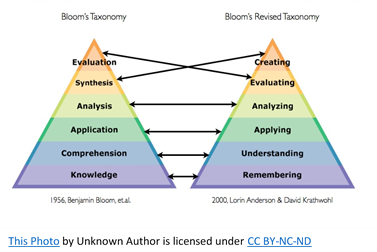 Bloom’s Taxonomy (the revised, two-dimensional representation) is BT. The cognitive dimension is Cog. The knowledge dimension is Know. An appropriate verb for a learning outcome is V.
LO = LN + BT (Cog + Know) yields V, which leads to LO. MLO = LN + BT (Cog + Know) yields P + Co + Cr, which leads to MLO. In the MLO equation, V is replaced by Performance (P), which would contain an appropriate verb at the appropriate dimensions on Bloom’s Taxonomy. Bloom’s Taxonomy (BT): How to connotes Apply on the cognitive (Cog) dimension and Procedural on the knowledge (Know) dimension. Three possible actions or verbs (V) are appropriate for the learning need: locate, install, or confirm. I choose install, as I judge that verb to be a clear action that directly addresses the core learning need. Install (LN + BT (Cog + Know) yields V) a memory card in a laptop. Given a memory card and a laptop (Co), locate (P) the memory card slot (BT Cog “apply”), install (P) the memory card (BT Know “procedural”), and confirm (BT Cog “apply”) that the laptop detects the presence of the memory card. All tasks must be performed within three minutes in the presence of an internal client (Cr). So, in this case, MLO = LN + BT (Cog + Know) yields Co + P + Cr, which leads to MLO. In this example, it should be noted that the order of the components in the objective is necessarily different from the equation because of semantic structure. As I noted earlier, all this is an attempt by a “non-math” person to think differently about how to represent to aspiring instructional designers the concepts of using Bloom’s Taxonomy and Mager’s model to construct learning objectives. In fact, I presented an early draft of my thoughts to some of my students recently in an email. Reviews were mixed. Most of my students did not readily identify with the “mathematical” approach, but a couple of them did. Does this approach have merit? The jury is out on that question for now. For me, though, the point was not necessarily the logic or the mathematical accuracy. Rather, it was the exercise—an attempt to think differently about something very familiar. I forced myself to travel far outside my comfort zone to gain that new perspective. In that regard, at least, I believe I succeeded. After more than 30 years of professional practice, maybe this “old dog” can still learn a new trick or two. Anderson, L. W., Krathwohl, D. R., Airasian, P. W., Cruikshank, K. A., Mayer, R. E., Pintrich, P. R., … Wittrock, M. C. (Eds.). (2001). A taxonomy for learning, teaching, and assessing: A revision of Bloom’s taxonomy of educational objectives. New York, NY: Addison Wesley Longman, Inc.
Mager, R. F. (1997). Preparing instructional objectives: A critical tool in the development of effective instruction (3rd ed.). Atlanta, GA: CEP Press. "I am not designing for monolithic stereotypes (learners, students, or teachers) but for real, live, fallible, brilliant, unpredictable human beings." --I love this! Such a powerful sentiment!